An unusually strong fascination or crazy desire to see lightening and thunder storms. A passionate addiction or desire to see or to participate in ballet dancing. A fascination with the various bullets which can be fired from a gun. A craze for establishing banks where money is stored for saving or commercial purposes or is supplied for loans or exchanged. Most countries have a variety of banks for businesses and for individuals who want to have a safe place for their income; however, sometimes there are too many banks and so some of them either go out of business or are taken over by other banking institutions. 1. A morbid tendency or compulsion to steal and to possess books. 2. A book thief who is regarded as someone who has a mental problem. —Word Info images © ALL rights reserved. A "private collector" acquires additional books for his personal library. 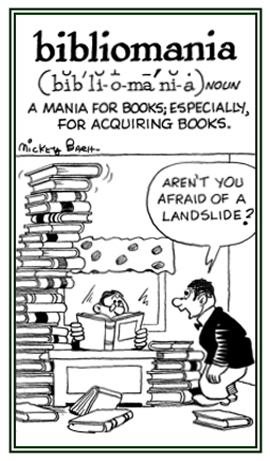 See another bibliokleptomaniac who was in the news. 1. A book thief who is often regarded as being insane. 2. Someone who has an uncontrollable or a compulsive desire to steal and possess books. An intense desire to collect and possess books; especially, rare and curious ones; crazy about books: Kim's bibliomania has resulted in a compulsion to have books stacked in all of her rooms, on and next to the full shelves. © ALL rights are reserved. A reference to anyone who has an intense and inordinate desire to collect and possess books; especially, rare and curious ones. A mental disorder which is caused by the use of bromine; an organic mental disorder produced by chronic bromide intoxication: Bromomania is a delirium that is caused by poisoning with bromine or any of its salts. 3. The involuntary, "nervous" grinding of the teeth while a patient is awake. It is thought bruxomania occurs as a way to relieve tension or stress and was first diagnosed as a medical condition in 1907. Someone who has a compulsive, and uncontrollable and continual crushing of the teeth together, with intermittent grinding. A nervous disorder that someone may have which is characterized by an abnormal grinding of the teeth. Showing page 3 out of 27 pages of 403 main-word entries or main-word-entry groups.